Goodreads Summary: The capital has fallen. First Thought After Finishing: Dear Leigh Bardugo, I love you, but I hate you. But I love you. Final books in trilogies are always bittersweet. I always want to know how everything ends, but it’s hard to say goodbye to characters that we’ve known and loved for so long. I wasn’t sure what to expect in this book—which was par for the course with this trilogy—but it was full of adventure and surprises. Alina is once again recovering from a battle with the Darkling, and the Apparat wants her to finally embrace her identity as the Sun Saint. Only Alina has a different destiny in mind—hunt the third amplifier and stop the Darkling once and for all. In the midst of realizing her destiny, she barely has time for love, but that does not mean that her choices aren’t there. In this final installment, Alina has tough decisions to make, and every second counts in trying to restore light to the world. "Beauty was your armor. Fragile stuff, all show. But what's inside you? That's steel. IT's brave and unbreakable. And it doesn't need fixing." If I haven’t said it before, I will say it now: Leigh Bardugo is brilliant. From the world to the characters, she has crafted a masterful story that will stick with you long after the final pages. It’s not easy to write characters you hate to love and love to hate, but she does. Alina went through some major changes in Siege and Storm, but here, we get to see some of her friends come into their own and start to shine. I loved getting to see all of them again, and it made me happy to know that their stories had resolutions as well. 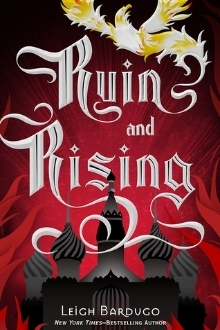 Bardugo also has tricks up her sleeve that keep changing the game with every chapter. Although there are some slower moments, the overall story is so gripping that it makes the 400+ page book fly by. I stayed up most of the night to finish it! And about that ending. I won’t spoil it in case you haven’t read it, but I’ll just say that even two weeks later, I’m still trying to decide how I feel about it. You may not love it (there’s always that risk, right?) but I have to admit that it’s fitting for the characters. Regardless of which characters you ship, you are bound to have an emotional experience while reading this book—and you will have the full range of emotions throughout the story. I know I did! Most Memorable Aspect: Yes. 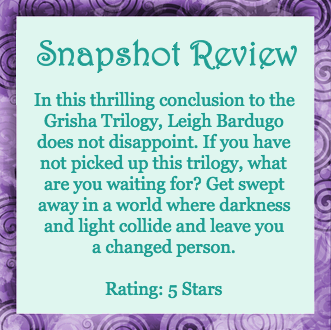 The characters, the story, the feelings—this is an epic fantasy trilogy that you won’t forget.